A common trope was the drama of an inspirational male educator entering a hopeless situation and turning it around while discovering a lot about himself in the process. 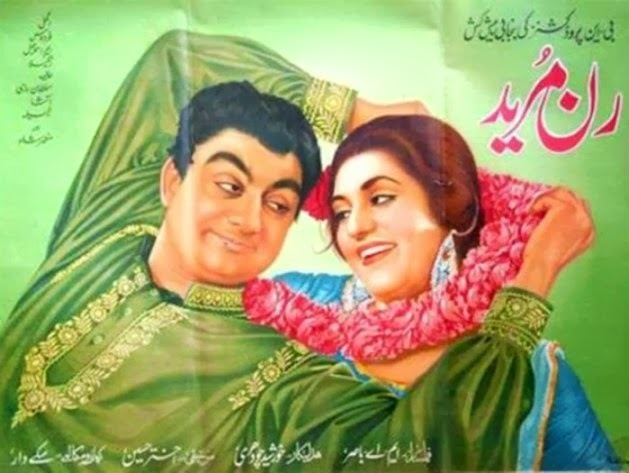 A key component of this brand of cinema was the danger invoked by this situation, the threat where doing the right thing gets you battered or even killed. It also enabled young ethnic minority actors to acquire gainful employment playing thugs and hoodlums. This is one of the most important and pivotal movies in cinema history. Blackboard Jungle pioneered a youth film language that is now the established paradigm for how to meaningfully connect with young audiences. This was the first movie to use a rock’n’roll song over its opening credits, instantly showcasing the glory of pop music when used in motion pictures aimed at teenagers. Ironically, Bill Haley & His Comets' Rock Around the Clock was merely a forgotten B-side released the year before, but when youngsters heard it blaring through movie theatre sound systems, it took on another life. Suddenly kids were dancing in the cinema aisles. They got so carried away by the perfect marriage of cinema and rock music that fights broke out at screenings. The UK being the home of rock’n’roll culture caused the greatest headaches for exhibitors whereby Teddy Boy gangs were so overcome by what they saw and heard that they started tearing out seats and slashing everything to bits. 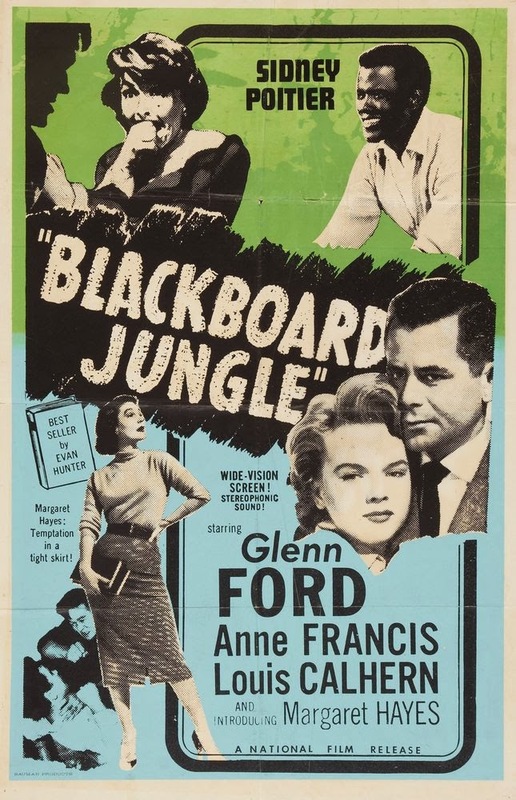 Blackboard Jungle was pulled from many cinemas over its corruptive influences, but it somehow played and played, scoring four Oscar nominations when all was said and done. It also broke out Sidney Poitier as a star to watch, who in this movie plays a leading juvenile delinquent. and Sidney Poitier needed to redeem his delinquent boyhood portrayal in that movie. The compromise was To Sir, with Love, Columbia Pictures’ loose adaptation of British Guyanese E. R. Braithwaite’s memoir of the same title. 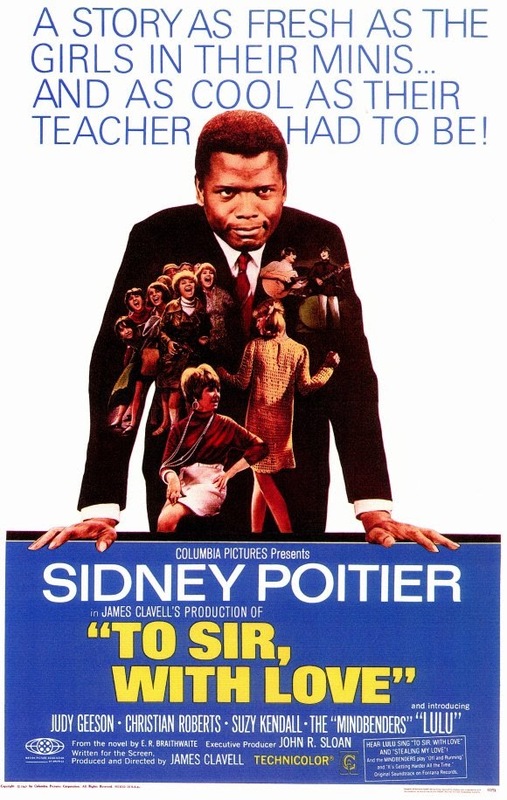 Poitier plays an unemployed engineer who applies to teach in a school located in the slums of east London that’s full of degenerate cockneys with bad teeth. Poitier takes names and kicks arse, reforming the cockney scum into citizens that might stand a chance in gentrified London life. The confluence of semi-hardened inner-city youth matched with a Swinging London setting proved to be a licence to print money for all involved. This life-affirming school drama was one of the top grossing movies released that year. Poitier negotiated one of the most stunning payoffs in film history, agreeing to star for a modest fee in return for 10% of all revenue in perpetuity, which works out to about $25,000 every year to this day. But it was Britain’s sweetheart Lulu who made the largest impact. Her title song for the movie stormed the US pop charts for five weeks and was the biggest song of the year. Lulu even plays one of the loser London kids, though her dodgy affected London accent is terrible. 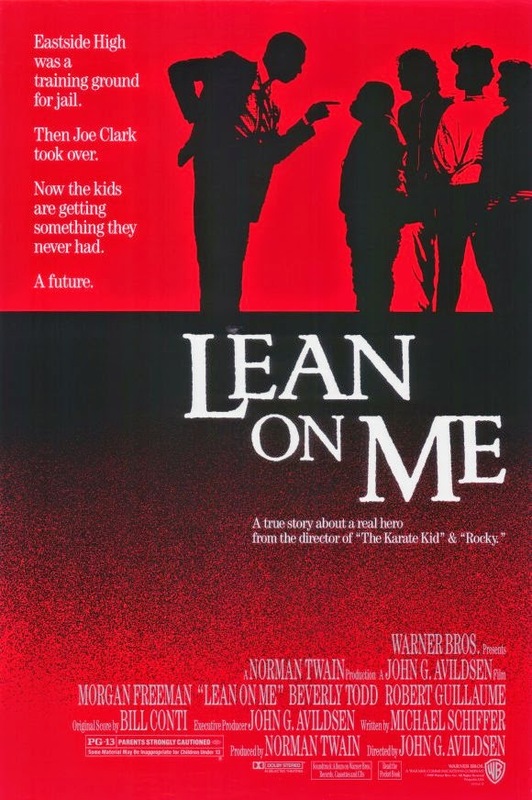 The Regan era got an inner-city school drama it deserved, though, like most things back then, it became a hyper-violent action thriller in which a motor-mouthed Jim Belushi motorcycles his way through the hellish corridors of a defunct school in south central LA, armed with a baseball bat. The 1980s seem a mad time in which edgy comedians were cast in leading roles over credible actors. Also, school kids were suddenly played by actors that looked ten years too old to be in school. It was also a period in which everything became overblown, with dialogue being literally yelled rather than spoken, and everything eventually culminating in absolute carnage. The Principal was a modest success on its release, and, unlike the films before, failed to harness the power of pop music to sell itself. Belushi’s film career ended with the ‘80s and the crass tone of that period eventually gave way to more earnest attitudes to storytelling. inner-city urban school drama that takes great liberties with real life story of Joe Louis "Crazy Joe" Clark, a baseball-wielding high school principal that reformed what can only be described as hell on earth. This was an attempt to reground and update the subgenre, utilising established tricks of old but infusing it with modern sensibilities. 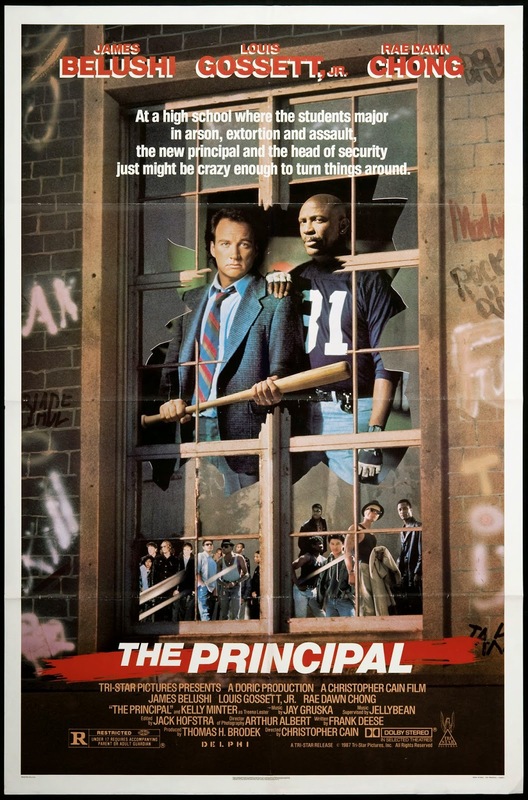 After a throwaway flashback depicting Crazy Joe’s thwarted idealism of yesteryears, the opening credits features a montage in which a female student is sexually assaulted and a teacher’s head is cracked open by some thuggish teens in a violent attack. All this plays over Guns‘n’Roses Welcome to the Jungle, proving the undeniable symbiosis of urban youth dramatics and relevant pop music. In fact, the film takes its title from the Bill Withers’ song, but licensing issues led to a cover version being used instead. The film also skirts over claims that Crazy Joe was eventually suspended by his school board after scheduling an assembly in which dancers stripped down to their G-strings. Crazy Joe later said he hadn't known about the dancers in advance, but something tells us that with great power came even greater irresponsibility. And so it ends here. This is the last of the iconic inner-city school dramas in which a reluctant scholar reforms the ailing fortunes of school while also bettering their own wellbeing in the process. Having exhausted the white male saviour and righteous black guy angles, the 1990s needed a woman’s touch, this time adapting former US Marine LouAnne Johnson’s autobiography My Posse Don't Do Homework and transforming it into a summer blockbuster. Dangerous Minds is Hollywood trash of the highest order. Despite its adult film rating, the movie was like an infant’s fantasy of urban hardships, but like most films of its canon, Dangerous Minds connected because of its ghetto-fabulous soundtrack. It shifted over 3 million units in the US alone, with Coolio’s signature track from the film Gangster’s Paradise becoming the biggest single of 1995. The song was so huge that Pfeiffer even appeared in the video. The inner-city urban school drama essentially ended with Dangerous Minds and was superseded by things like High School Musical and Glee.